Budget air carrier Primera Air, which earlier in 2018 expanded into the U.S. and announced recently more flights for the summer of 2019, will go out of business. The budget carrier based in Europe said via a statement posted on its official website that it was ending its operations as of October 2, but effectively ceased operations Monday October 1. Seven Primera flights between the U.S. and Europe were cancelled that had been scheduled for Monday, which stranded many passengers. The canceled flights, according to one of the flight tracking services were: London-Washington Dulles and Dulles to London; Paris to Toronto, Paris to Newark; London to Newark; Toronto to Newark and Toronto to Paris. The statement posted on the Primera website said that on behalf of the team at Primera Air we want to thank you for all your loyalty. The statement added that on this sad day, the airline is saying goodbye to everyone. The statement did not include any information related to refunds for tickets. 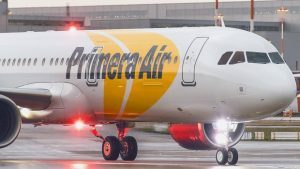 A spokesperson for the authority that oversees the Washington Dulles airport, said that travelers with tickets for Primera flights must go to PrimeraAir.com to receive more information. However, when the website was checked, no updated information was found related to refunds. Year round service was launched in August between London and Dulles, with five flights weekly and plans were in the works to add more. The shutdown of the airline arrives less than two months following the no-frills airline touting its three latest routes between the U.S. and Europe with fares of $149 one way. The airline was planning to fly to Boston, Newark and Washington Dulles from Brussels. Primera, which is based in Latvia, unveiled its expansion into the U.S. in August of 2017. The airline released information on six flights leaving Newark Liberty and Boston Birmingham, England, London, and Paris with Airbus A321 aircraft. Those flights started early in 2018.